Check it out, baby: Little Steven and his powerful 14-piece band The Disciples of Soul, performing live around the world! Includes guest appearances from Bruce Springsteen on "Tenth Avenue Freeze-out" and "I Don't Want to Go Home," as well as Richie Sambora, Peter Wolf, and Jerry Miller. With a total running time of 213 minutes across three discs, Soulfire Live! includes 12 additional songs to the download version that was released nearly three months ago. 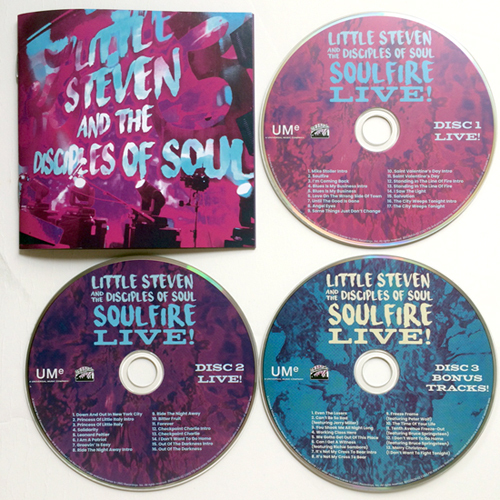 Recorded at various unspecified locations, the first two discs of Soulfire Live! replicate a typical show from last year's tour, from opener "Soulfire" to closer "Out of the Darkness." Bonus tracks are on the third disc, the majority of which are once-only covers of songs by the likes of Tom Petty, John Lennon, and The Allman Brothers, plus tracks with those aforementioned special guests. The fold-out package includes a 32-page full-color booklet packed with fan photographs, musician and production credits, and extensive song annotations by Steven. Soulfire Live! 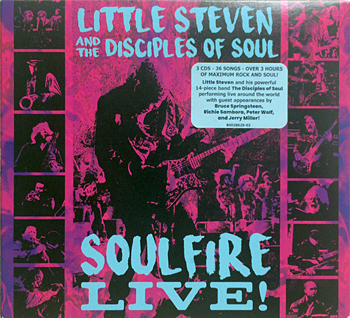 (which will also be released on vinyl) captures the exciting atmosphere of Little Steven's first tour in almost three decades and provides a musical history lesson as it switches genres from rock to soul, blues, jazz and reggae. If you were there, it's a perfect souvenir. If you weren't, it will make you want to come next time.